Researchers: R. Douilly and A. M. Freed, Department of Earth and Atmospheric Sciences, Purdue University, USA; H. Aochi, Bureau de Recherches Geologiques et Minieres, France; E. Calais, Ecole Normale Superieure, Department of Geosciences, UMR CNRS, France. The 2010 magnitude 7.0 Haiti earthquake occurred on a secondary blind thrust fault, the Léogâne fault, rather than on the Enriquillo-Plantain Garden fault (EPGF), the major strike-slip fault that runs through the southern peninsula. 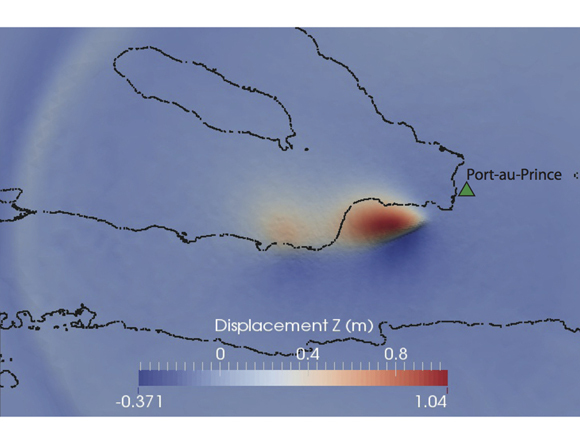 Detailed modeling replicates a sequence of two ruptures propagating from two planar segments of the Léogâne fault. The model generates surface deformation that fits the geodetic observations (i.e., GPS and coral uplift). 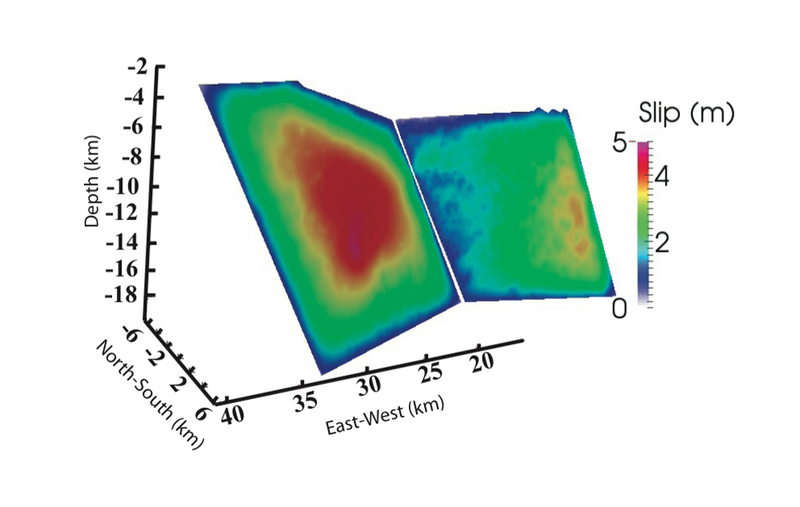 The best simulation shows that the rupture did not trigger the EPGF or the Trois Baies fault because of their geometry, frictional values and orientation with respect to the Léogâne fault. There has been significant stress buildup on these faults, so future risks should be considered. Historical records indicate that large earthquakes in 1701, 1751 and 1770 probably occurred along the EPGF. Today, Global Positioning System (GPS) measurements help to define plate motions and seismic risks by capturing millimeter or larger changes in the earth’s surface related to faulting. Following the 2010 Haiti earthquake, geodetic, geologic, and teleseismic studies showed that this event did not rupture the EPGF, but rather a previously unmapped fault, the Léogâne fault. A primary concern and question is why rupture on the Léogâne did not transfer or trigger rupture on the larger and active EPGF. A finite element mesh with millions of tetrahedral elements simulates rupture on the Léogâne fault. The model tests many different stress orientations and frictional parameters to find the characteristics that most closely match the observations, especially the ground displacement. The two patches of slip, inferred from the modeling, can be explained by a sequence of ruptures along the Léogâne fault. The first slip was initiated on the eastern segment of the fault and about 4 seconds later, the second slip was triggered on the western segment of the fault. The EPGF and the Trois Baies fault did not rupture because of their geometry, their friction parameters, and the fact that the increase in stress were insufficient to overcome the failure stress that would cause these larger faults to break. The 2010 event did build up stress on the EPGF and Trois Baies fault, so future seismic risks should be carefully considered. References: Douilly, R.; H. Aochi; E. Calais; A. M. Freed (2015), 3D Dynamic Rupture Simulations Across Interacting Faults: The Mw7.0, 2010, Haiti Earthquake. J. Geophys. Res. Solid Earth, 120, DOI: 10.1002/2014jb011595 10.1002/2014jb011595.